Thirteen-year-old Brian Robeson is flying north to spend the summer with his father when the pilot, the only other person on the small plane, has a heart attack and dies. 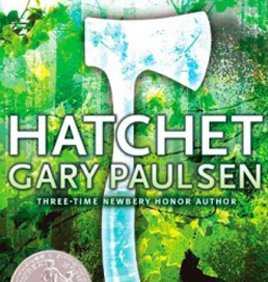 The plane crashes in a lake in the Canadian wilderness, stranding Brian with only his clothes and a gift from his mother: a hatchet. When a quick rescue does not appear, Brian relies on his own ingenuity to construct a shelter, make fire, find food, and protect himself. His life in the woods is full of challenges, but overcoming these helps him come to terms with the recent divorce of his parents.